With the kids back to school and all manner of new commitments pulling at your family, there are two tried and true ways to keep your family connected ~ family meals and family game night! While my family's multiple after school commitments, sports, band and Destination Imagination to name just a few, tend to have us all running in separate directions during the week, my husband and I insist on family meals and at least one fun family activity each weekend. Although our individual preferences run the gamete, with a little creativity, we can usually come up with some meals and activities that everyone will enjoy. One of our favorite family meals is home made pizza, with everyone getting in on topping preparation and selection. As sports fanatics, we each have a bit of a competitive streak, so board games are always a treat, with laughter and silliness all around. Courtesy of Hasbro and Hunter PR, my crew was given an opportunity to test one of the latest offerings from the Hasbro game line, Scrabble Electronic Turbo Slam! How fast can you create words? Slap down cards to change the words on the table. Then, slam fast when you hear the turbo sound from the Turbo Slam unit. If you slam first, grab an action card. What’s in store for you? The only way to tell is to play, slap and slam! Includes electronic Turbo Slam unit with storage tray, 55 letter cards, 12 action cards and rules. Requires 3 “AAA” batteries (not included). For 2 to 4 players. Ages 8 and up. One of the things I appreciate about Scrabble Turbo Slam is the educational base in promoting spelling. With a younger reader on our "crew", Scrabble is a great game to promote both spelling skill strength, as well as vocabulary expansion. Of course, we can always count on my husband to keep the laughter rolling, as he insists, usually unsuccessfully, on trying to insert non words into the mix! The faster pace and additions of the Slam Button (a crew favorite! 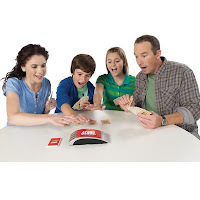 ), sound effects and action cards really speaks to my family's personalities and makes this version of Scrabble one of our favorites. 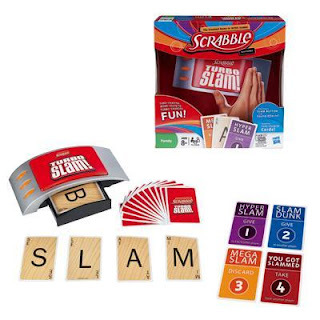 Scrabble Turbo Slam uses cards and any flat surface, as opposed to the traditional board and tiles of the original version of Scrabble, making it a game that is more travel friendly and perfect for taking on our camping trips! No more hunting around for small, wayward tiles! 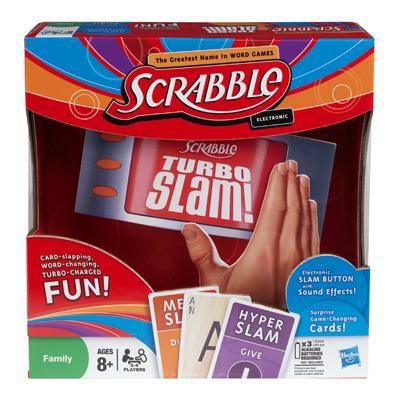 Add Scrabble Electronic Turbo Slam to your game collection! Courtesy of Hasbro and through Hunter PR, That's What She Said readers have an opportunity to win a Scrabble Electronic Turbo Slam! Please note: this giveaway ends Sunday, September 12, 2011 at 12:01am EST. The winner will be notified by 8:00am via email and must respond with full name and shipping address by 12:00 noon EST! THIS GIVEAWAY IS CLOSED! THE WINNER HAS BEEN EMAILED AND WILL BE ANNOUNCED SOON! On behalf of Hasbro, Hunter PR and That's What She Said, thank you to all entrants for participating and following! I was provided with a copy of Scrabble Electronic Turbo Slam, courtesy of Hasbro, through Hunter PR, for the purposes of creating this feature. The opinions above are both honest and my own. Images sourced from various Hasbro sites. Facebook is not responsible for nor involved in this giveaway in any fashion. Sponsor is supplying and responsible for shipping prize. My favorite new game Cars 2 Operation! Cars Monopoly looks fun ... my kids would love it..
we play board games every sunday its our family day... are kids are still small but we all have fun and it is a great way to help her learn to count.. I am really looking forward to Scrabble Electronic Turbo Slam. My daughter loves the card game Scrabble Slam. This new game looks like fun!